Ford is showing off the current state of its Android Auto implementation at CES, which will roll out to current and future Sync 3-equipped cars later this year. In many ways, it matches that of other auto makers where Android Auto is sort of like an app inside of their own custom interface. 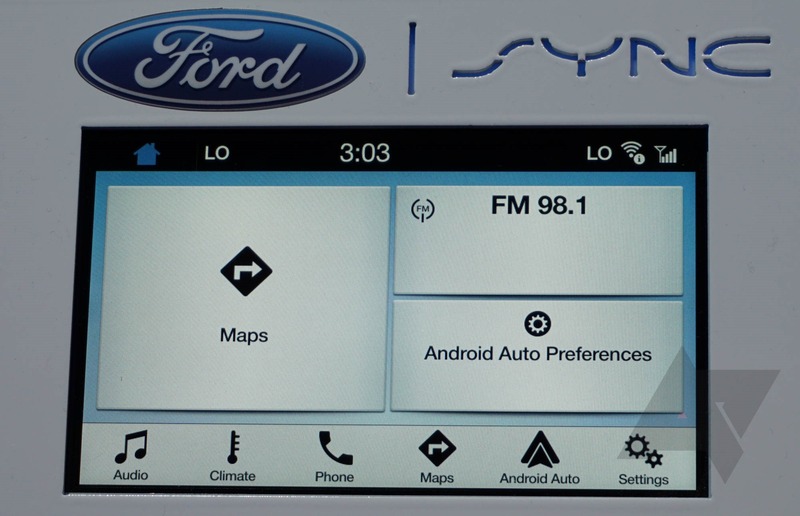 However, a representative at Ford's booth explained that Sync 3 has been optimized to stay out of the way when Android Auto is running by hiding its own redundant systems like the built-in navigation and phone apps. Many other in-car systems tend to prefer their own navigation and dialer if they are opened from within the custom interfaces, but Ford will automatically launch Google Maps and Auto's own dialer, regardless of which interface you're looking at. 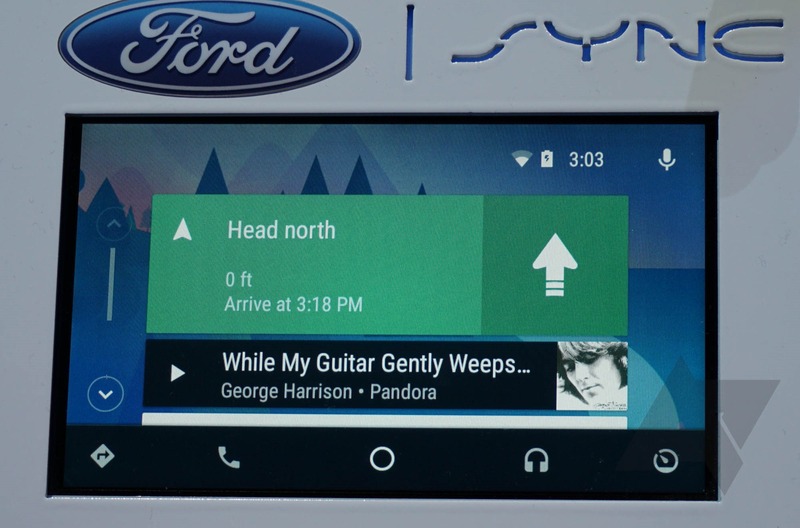 Another area where Ford is working to improve the experience with Android Auto is with data integration. Google is responsible for the interface of Android Auto, which means it will look and function (mostly) the same across every brand and model of car on the road. But that doesn't mean car makers are completely out of the loop with Auto — they have the ability to listen for events and read data exposed by Google's platform for the purpose of customizing their own infotainment systems. 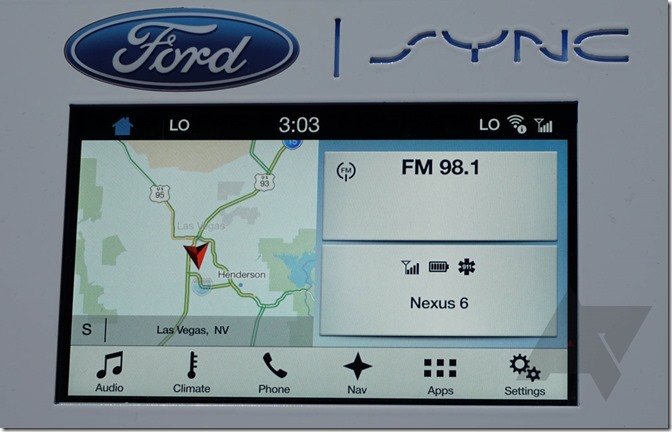 We've got some pictures of Ford's interface and how it will look while Auto is running in the background. Of course, Auto will look the same in the foreground, so we're not going to repeat any of those pictures. The first is mostly a reference shot, it shows Sync 3 running without Auto. (Note: The Nexus 6 is connected over Bluetooth, not a wire, so Android Auto is not active.) Navigation and music are active in this shot. The second shot is with Android Auto attached. The Apps button from the first shot switches to the Android Auto logo and launches the Auto interface when tapped. 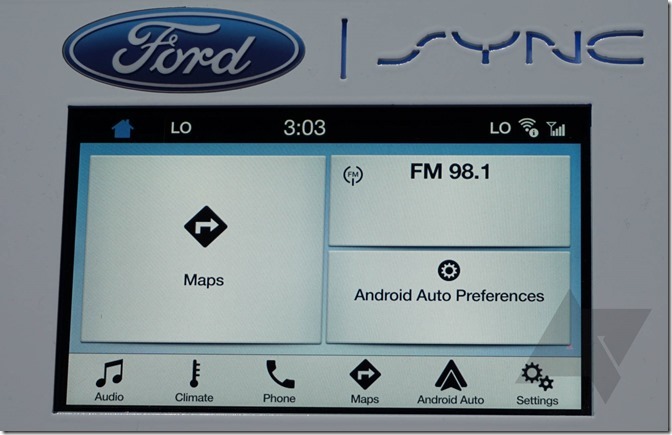 The bottom-right panel also switches to a large button that will take you to a screen to configure how Sync works with Android Auto, but that screen is currently limited to a single toggle to disable Auto altogether. There will probably be a few more options in the future. 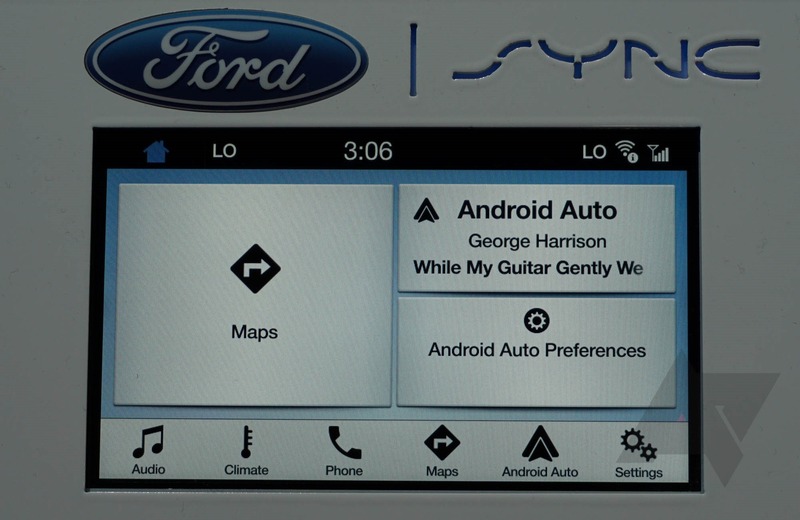 The third shot shows Sync with Android Auto as its audio source. This is obviously the one place where Ford doesn't shut out its own audio sources in favor of Auto. Sources can be chosen by tapping on the Audio button at the far left. It's worth noting that the huge space on the left side normally occupied by Sync's built-in mapping software is currently replaced by a massive Maps button when Android Auto is attached. The Ford representative we spoke with could not comment about any future changes, but we think it's probably going to show turn-by-turn directions when Ford releases the Sync 3 update with Auto support later this year. Honda currently leads the pack in terms of integration in the Accord with a second screen that shows your currently playing music, calling status, and turn-by-turn directions straight from Google Maps (I love that part). Ford's off to a good start, so we'll keep an eye out as progress continues.